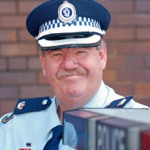 Gary Raymond – "God's Sherriff Of Cambramatta"
One of Australia's toughest, most respected policemen, is a 'hands-on' law enforcer. His familiar profile on the streets has led people to call him the 'Sheriff of Cabramatta.' He was a success, becoming part of an elite Police Rescue team that most only dream about joining. He felt superior and proud and didn't need God. He had years of Christian teaching at Sunday school, but never any commitment. One day he realised that his life was in a mess and even contemplated suicide, ironically he was a 'suicide negotiator,' . His marriage was destroyed and he was drinking heavily. But at the point of desperation, he met Jesus, his maker and his life was miraculously transformed. Gary shared many stories of how victims and perpetrators found Jesus through the ministry of this Compassionate Cop.